Empty Nest: A Dose of Self-Awareness! Tomorrow, Mari McCarthy will guest post here and the giveaway for one of her books will begin! Please visit Mari's website, CREATE WRITE NOW, and check out all the wonderful journaling ideas she offers. You can also access her blog from there. This is Mari. (The picture came from her website). 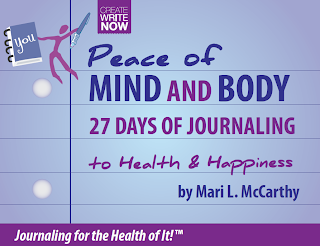 Today is my first day in Mari's book Peace of Mind & Body 27 Days of Journaling to Health and Happiness. Day 1 is about awareness and the assignment is to turn to a fresh page in your journal (this is a good way to start journaling if you don't already) and write at the top of the page: "I am aware that..." then write your response until you feel that you have written all that you can/need to/etc. OH, and this is the book that I am going to be giving away to a lucky winner! You will have your choice between an ebook or a print copy! Self-awareness can not only help us recognize exactly who we are, but it can also be a good way to clear out the negative things that hold us back! 1. I have selfish tendencies. Maybe they stem from being an only child for many years or maybe it's just who I am but I can be SELFISH. I want to watch what I want to watch on television; I want to go where I want to go and do what I want to do; I want things done the way I want them done; etc. And, most of the time, I do not care to discuss it, I just want it done. A 'My way or the highway' kind of gal. I can honestly say that I have come a long way in my attempts at overcoming this selfish nature of mine but, I am not there yet. 2. I am overweight and that the reason I haven't lost the excess may be due to the fact that I am too lazy or that food is one of the things I use to provide me with happiness. 3. I am somewhat lazy. Or a procrastinator. Or both. I will do what has to be done, but if I can put something off, it gets put off. If hard work is involved I may or may not participate. That is laziness. Or still being tired from raising four daughters. Regardless, I know that this is an area that needs improvement. 4. Food is one of the things I use to comfort myself and make me happy when people do not. I am aware that I do this but I am also aware that I am the one responsible for my happiness, not others. And I'm working on this one too. 5. I still miss my grandparents. And they've been gone a really long time. But they were so awesome and completely understood and showed unconditional love. 6. I harbor some resentments...and let's just leave that one right there. 7. I am short tempered. I will say that this has improved TREMENDOUSLY over the years! There is still plenty of room for improvement here, but it's so much better than it has ever been. 8. I hate to judge others but I find myself doing it sometimes anyway. And I hate that, sometimes, I preface it with something STUPID like, "This isn't judgment but...." or "I know this is a judgmental statement but..." I really hate this one more than any of the others. AND I hate being judged so you would think that I wouldn't do it to others. I guess I just made myself aware that I am a hypocrite. DARN this self-awareness crap. 9. I am on the defensive a lot. It seems almost constant. I am unaware of why. 10. I am overly critical of myself. I put expectations on myself that no one could reach and then berate myself for failing. And there you have it--ten things I'm aware of about myself from a list that covered 3.5 pages of my journal. #9....I too am defensive. But I think I know why I am that way. I am the youngest of five, and I grew up defending my position in the family and it's continued throughout my days. As in school...I was always the smallest of my friends. It always took a lot from me to support myself so others could support and accept ME. #5...you're so luck to have a memory of your grandparents. I do, but all died but one before I was 5. Thanks for visiting ...hope your Monday is treating you well. Wah! Howl - I'm away for five days and have no internet from 3am tomorrow....boo hoo! I'll miss this post and I'm very upset. maybe I should cancel my trip? You are brave to let us in on your journaling. I too miss my grandparents and my parents. As far as your 'shortcomings', we're all in the same boat, all have things we harbor in our lives that need to be cleaned out. Praise God for a patient and merciful Rescuer. I share many of your selfish tendencies and yet I never thought of myself as a 'my way or the highway' person. I just figured when the show I want to watch is obviously superior, who could argue? This looks like a very difficult journal exercise. Kudos to you for actually getting it down on paper. And then sharing it. Carol- Don't cancel your trip just reroute it to South Carolina! Betty- I'm not sure I am either...but we'll soon find out! Stephanie-You make an excellent point! There are many more that I put down that I didn't share because then y'all would see that I have to add shallow to the list. Oh darn it! There's another one...crap. You are a brave woman to be so very open and honest here. I'm not too sure I'm ready to dig so deep...it might hurt! Heeehehe! The book does sound quite interesting though. God bless and have a beautiful week sweetie!!! wow, thanks for sharing. I am an only child too. I am the opposite. I tend to do everything for everyone, and then get frustrated when there isn't time for me. I always think I can do more than I can, and then I get angry and upset, yet I know it is me to blame. Hilary-I always did that for my girls but no one else! Betty-I hope it helps! Bless you Betty for letting me know that I am not alone! I feel better already! I don't need self-awareness, I just need bloggy friends! Self-awareness is looking a bit scary. Maybe I know the answers to most of these but don't always want to say them outloud. Sounds like a terrific book for a soul seeking person. Take care and have a blessed afternoon. Jane- You are hilarious! Love it! Julie- We'll just see how it goes. I may very well hit a spot that I won't share...and I only shared 10 things from my 3 page list. Yikes! i'm a lot of things in your list as well. i love a good dose of self awareness. it can be a scary thing but if you have a sense of humor about it you can course correct and have a good laugh at yourself all at the same time. but its really hard to put this stuff out there, so kudos to you for being brave enough to share! Wow! I can so identify with what you've written - most of your list I could have written myself. You know what they say - the first step in fixing any problem is recognizing it's a problem! Donna-That's the way I heard it too...let's hope it's true! This was a really good post, good and courageous. I suspect many of us could share your list, I know I saw myself in a lot of your self-awareness. Wow! I could have written your list. Sounds like a book I need to read. Alessandra-Thank you! I did leave out the really deep stuff, but I am finding it to be somewhat liberating. Beverly-Enter the giveaway! That's the book that someone is going to win! And it's a good one. Wow, there is literally only one thing on this list that isn't something that I could/should say about myself. Jessica- At this point, I'm not even surprised anymore. You and I must be related! And I hope it's long lost sisters because I can't think of a nicer person to be related to!